The choir master of St. Patrick’s Junior Choir Drumgreenagh has had to deny the children were ‘miming’ on Britain’s Got Talent last night. The choir of children were about to open the show with their rendition of Katy Perry’s Roar when a sound issue halted them and what sounded like pre-recorded vocals proceeded to play. 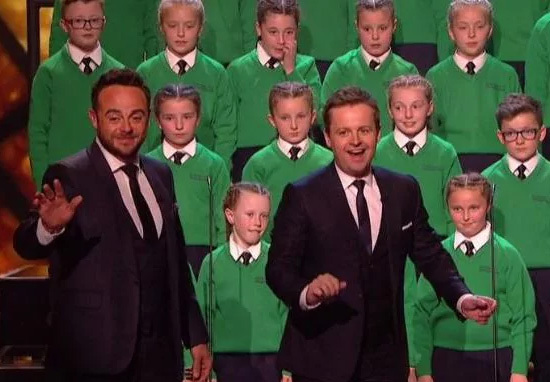 Ant and Dec were forced to interrupt the performance and the background vocals caused a lot of controversy, with the audience accusing the act of lip syncing. I know we had a little hitch at the beginning, but it’s live TV. It happens to the greatest artists in the world. Adele, I think, at the Grammys – there was a technical hitch there too and she had to stop and start again. We managed to regroup. I don’t think [the children] even realised anything in particular was wrong. They just knew their little introduction hadn’t been played so they stood there and waited. Then they realised the section that was playing wasn’t what they were waiting for. It was the first live show of the series and the producers insisted there was a ‘technical problem’ that meant the kids wre out of time with the backing track’. You can undoubtedly hear singing when the children aren’t singing though. McCaughey did not explain these issues however sad the children aged eight to 12 has rehearsed for ‘hours, days, and months’. The group of 36 previously sang Somewhere Only We Know. It’s safe to say Twitter were not impressed and that strange backing track has not been explained.